Last week in this column, I wrote about the controversy over moving President James K. Polk’s body from the state Capitol to his family home in Columbia. The resolution authorizing such a move passed the Tennessee senate last spring but didn’t make it to the house and the governor. Supposing the measure had passed, how much of our eleventh president would likely be left to rebury if he were dug up? The only way to know for sure would be to open the copper casket he was buried in, which almost certainly wouldn’t be decayed. When Polk’s and wife Sarah’s remains were moved from their soon-to-be-demolished Nashville home to the Capitol grounds in 1893, both caskets were in a perfect state of preservation. Maybe they still are. But it’s for sure the same can’t be said for their contents. Left unchecked, human decomposition begins about four minutes after death. A body that hasn’t been embalmed passes through four stages of decay: self-digestion, bloat, active decay and skeletonization. Modern embalming didn’t get its start until the Civil War, when “embalming surgeons” and undertakers preserved fallen soldiers’ bodies so they could be returned home for a decent burial rather than being interred on the battlefield. Such a practice was not around when Polk died in 1849, so nature went to work quickly on his body. Heat, moisture and insects did exactly what they’re designed to do—liquefy and destroy organs, muscles, skin and hair that the dearly departed no longer needs. As for Polk’s bones, it’s impossible to say if they’re anything but powder without looking at them. The rate at which bones decay varies widely. Within 50 years, most buried bones become dry and brittle. The drier the climate, the longer bones will last. Since Polk was buried in anything but a dry climate, his skeleton is likely not in very good shape. Is the same true of Presidents who have died and been buried in modern times? No. Sophisticated embalming techniques that came into widespread use in the last half of the twentieth century replace blood and other bodily fluids with a preservative solution. An embalmed body might remain intact for decades, especially if the casket it’s laid in is placed inside a concrete vault. If anyone was inclined to want to dig up and look at Presidents Eisenhower, Kennedy, Johnson, Nixon, Ford or Reagan, they would almost certainly find them in much better shape than James K. Polk. 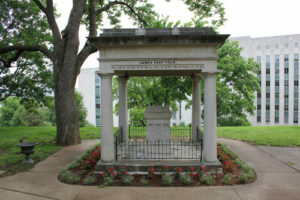 But the condition of Polk’s remains, no matter how far gone they are, has no bearing on whether his body should be moved and buried for the fourth time. Whatever is left of the valiant little man who served his state and his nation so tirelessly and so well should remain undisturbed. Rest in peace, James K. Polk. Rest in peace.